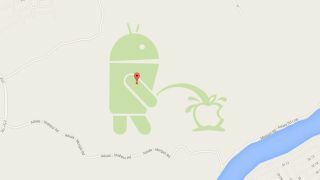 After publicly apologizing for the image of the Android mascot peeing on an Apple Logo that appeared on Google maps, the search company plans to turn off custom map editing until it can deal with pranksters. Apparently since the initial incident, which also included a separate image defaming Google's review policy, spammers have escalated the number of added obscene edits. Now in an attempt to poo-poo on the prankster party, Google announced it will temporarily taken its Map Maker crowd-sourced map editing tool offline starting May 12. "We have been experiencing escalated attacks to spam Google Maps over the past few months," Pavithra Kanakarajan, Google product manager, wrote in a Google Product Forums post. "As a consequence, we suspended auto-approval and user moderation across the globe, [un]till we figured out ways to add more intelligent mechanisms to prevent such incidents." Following the discovery of prank images and spam edits, Google promised to improve its spam detection system for the Map Maker, now it appears that isn't enough. According to Kanakarajan, Google plans to temporarily disable editing across all countries until it has brought its moderation system back online. Though there isn't any hard date on when map editing will come back, Kanakarajan stresses this will be a temporary solution and one they hope to resolve as soon as possible.